Rain Guard Inc. is one of the largest gutter companies in Oklahoma with a focus on seamless gutters and Gutter Helmet, the #1 gutter protection system in the world. We have served over 250,000 Oklahomans for over 31 years. Rain Guard provides our customers with the products and services they need to ensure they have the best outcome possible for their home improvement needs. Most homeowners don’t realize the importance of their rain gutters and downspouts. They aren’t there just for looks; they help keep moisture out of your home. If they aren’t functioning properly due to improper installation or because of clogs, they will fail to carry rainwater to your downspout and away from the house. If this happens, rain can spill over the sides and compromise your foundation, walls, soffit and fascia boards, and generally, cause wet conditions that support mold, wood rot and a host of other problems. Homeowners are familiar with how leaves and other debris fill their rain gutters and require regular cleaning. When the gutters become clogged, you might as well not have any rain gutters. 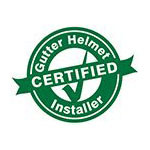 That is why Rain Guard, Inc. recommends Gutter Helmet whenever we install our seamless gutters. We are Oklahoma’s certified dealer for this patented gutter protection system. The nose forward design allows rainwater in and keeps gutter-clogging leaves and debris out so you don’t have to worry about cleaning your gutters again! To learn more about seamless gutters, Gutter Helmet® and our other services, please call us at (800) 824-3772 or fill out our online form here.